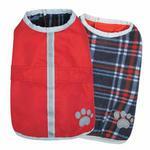 Keep your pets cozy and warm this winter with the Zack and Zoey Nor’easter Dog Blanket Coat in Red! 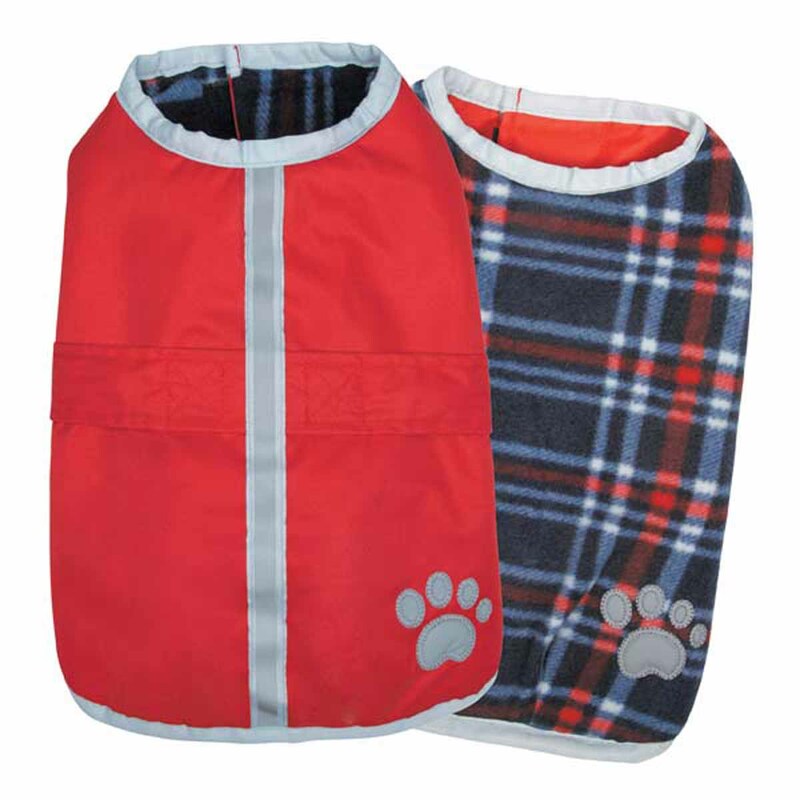 Help pets take a bite out of nasty weather with Zack and Zoey® Nor’easter Blanket Dog Coat in Red. Each jacket features a reversible waterproof shell, a soft plaid fleece lining and a reflective stripe and paw print detailing. We love this bright red color and classic navy and red plaid. It's a great way to banish the cold-weather blues! Nor'easter Dog Blanket Coat - Red Customer Photos - Send us your photo! The plaid fleece side looks so pretty! So warm too!! Our 2 rescue dogs love their Nor'easter Dog Blanket Coats! They stay nice and warm while playing together in the snow. Size XL fits them both comfortably. Kenzi (left) is 70 lbs and Khloi (right) is 85lbs. Our five Vizslas enjoying a snow day! Nor'Easter Dog Blanket Coats are the best winter jackets.Quick and easy to slip on and really warm. All 5 dogs wear the large size, even the puppy! This is Kasey modeling her new winter coat. This little southern pup was recently adopted from Mississippi and we are having fun shopping at BaxterBoo for warm winter clothes. This Nor'easter blanket coat will definitely keep the chill off during our cold New England weather!!! Submitted Sissy's picture before. But it only showed the comment. She is in a Zack & Zoey nor'easter blanket coat and her booties. Ready for the winter. Sayde's first winter. With record snow fall this winter in New England, this Nor'easter Dog Blanket Coat saved the day. Chloe keeping warm and dry! Chachi looking spiffy in her new Nor'easter doggie coat! Bo stays warm 4-wheeling and looks stylish as well!! Relaxing after coming-in from the cold. Koko enjoying our latest blizzard in her warm and cozy Zack and Zooey all weather coat. Posted On 11/13/18 by Tony S from Bernardsville, NJ Yes, Tony S recommends this product! My miniature schnauzer, Winston, loves his new dog blanket. When it's below 45 degrees, I put it on every time before taking him out. The dog blanket is so easy to put on and take off. Winston expects to wear it now! Posted On 12/16/17 by jean n from Stanfield, NC Yes, jean n recommends this product! This is the second one i have gotten. it fit's my dog just fine. i got another color i liked it so much. i really like this company. The fit is good. It is light and easy to put on. Posted On 03/15/17 by Joyce B from Springfield, MA Yes, Joyce B recommends this product! I love this coat. Molly is a lab mix and not crazy about wearing a coat. But with a blizzard even she stayed mostly dry play in the snow. I have Pomeranian that has the same coat too. I recommend this product to anyone. Posted On 03/02/17 by Traci W from , NE Yes, Traci W recommends this product! We love the super soft fleece lining and the waterproof outer shell for the rainy snowy days! It's easy 2 straps makes it quick to put on and take off. Posted On 01/29/17 by Katherine Chermak from Copley, OH Yes, Katherine Chermak recommends this product! This is great! And it is true to size. Easy on and off, which is something both the dog and I like. Posted On 01/10/17 by Susie T from , KS Yes, Susie T recommends this product! This is very nice for a light weight jacket or rain slicker. Thin but warm. Measuring chart is spot on. Love it! Posted On 12/27/16 by Kathy V from Kirkwood, PA Yes, Kathy V recommends this product! We got matching coats for our Millie and Ollie! They are very warm and cozy, and very good quality! Posted On 12/25/16 by Ellen G from Elkton, MD Yes, Ellen G recommends this product! 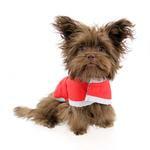 Very nice coat for our dog! Fits well. Waterproof on outside and cozy flannel on inside. Easy to put on her with 2 velcro straps. I definitely recommend this product! Posted On 12/23/16 by lauren c from lockport, IL Yes, lauren c recommends this product! I bought 2 of the red.. The size large was quite big I followed the sizing recommendations and chose using the chest size but it was too large.. The second one was a size medium and was too tight around chest. Fortunately I was able to alter both. Posted On 12/22/16 by Patricia S from Lake St. Louis, MO Yes, Patricia S recommends this product! I love the product. I had purchased this brand from a local Rual King in Missouri. They did not have the size I was looking to get for my granddog. I went to your website and found one. The first one I got was too big, so I ordered a smaller one. I hope this one fits. My only gripe is that It cost me &6.75 to return it and I had to pay for shipping on the last purchase. The quality of the product is the best. Posted On 12/14/16 by Jacqueline L. R from Elliottsburg, PA Yes, Jacqueline L. R recommends this product! Love this item - fits perfectly. Great product. Posted On 12/12/16 by Cynthia L from East Lyme, CT Yes, Cynthia L recommends this product! Excellent quality but too large so I have to return it ?? Posted On 11/24/16 by Danette C from Austin, TX Yes, Danette C recommends this product! This is a very nice, easy to put on winter coat. It fits great and love that it is reversible. Posted On 11/22/16 by AB from , MD Yes, AB recommends this product! I bought this for my 40 lb pit mix in size large, and it fits very well! I love that it has a reflective strip, and the inside flannel is super warm and cozy. We will be getting plenty of use out of this coat this winter. I definitely recommend! Posted On 11/17/16 by JoAnn L from , OK Yes, JoAnn L recommends this product! The colors are vibrant and the quality is what I would have expected from BaxterBoo. I appreciate BaxterBoo's wide choice of great quality products, along with their great customer service. Love this coat. Our recently adopted pup is from Mississippi, so we needed a warm coat for our cold New England weather. The color is beautiful and the fit guide was a great help in determining what size to order. I also really like that warm fleece lining. Great coat at a great price. Love BaxterBoo products!!! Posted On 12/27/15 by Sandy from Lafayette, IN Yes, Sandy recommends this product! This coat is just a perfect dog coat. I love how easy it is to put on my dog. I even leave on his Fido Fleece and put this coat over it for additional warmth in the winter. My stafforshire terrier has no fat, so he needs extra warmth in the winter months. So, I use this coat and the fido fleece to keep him warm. They work great together! Posted On 12/06/15 by teresa s from , TX Yes, teresa s recommends this product! My 12 year old boxer loves her new coats. And I know she is warm on our chilly nights . Posted On 10/27/15 by Kimberly P from Prattville, AL Yes, Kimberly P recommends this product! Awesome little coat! Looks great on my black and tan dachshund! It fits great and looks very professional! I bought this coat 4 years ago and it's been worn a lot. It's still in great shape. I was so pleased to be able to find a coat to fit my great dane!